‘Surf’s Up’ at 24,000ft over Georgia, US. The classic 1964 surfing documentary, The Endless Summer, followed the adventures of three surfers traveling from Malibu to Ghana, via Nigeria, Australia, New Zealand, Tahiti, and Hawaii in search of the perfect wave. Cloudspotters can experience their own perfect wave too, without ever having to leave home – all they need is a lot of patience. The only down side to the ultimate aerial breaker, is that it has the particularly un-hip name of the ‘Kelvin-Helmholtz cloud’. The breaking waveforms of ‘Kelv-Helmz’ (as they aren’t known) are the result of shearing winds up at cloud level. A particular type of turbulence can develop in a layer of Cirrus cloud, which happens to form below an inversion* between air currents of differing speeds and/or directions. Sea waves break as their bases are slowed down upon reaching shallow water and their crests surge ahead. Cloud waves break in the same way: when their crests are pushed ahead of their troughs by the difference in air currents. 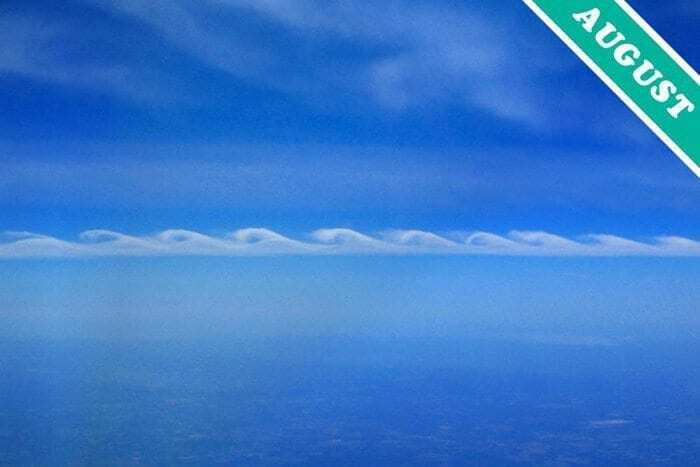 Though spotter-dudes won’t have to cross the world to see this formation, those in search of the perfect Kelvin-Helmholtz will have to wait a while. This most beautiful and transient of formations may appear over most regions of the world but it only ever does so on the rarest of occasions. *An inversion is a region where air temperatures change with altitude in such a way as to act as an invisible ‘ceiling’ that stops clouds from rising through it. I have been lucky enough to have seen these clouds this year in between Santa Fe and Albuquerque, NM at dusk. I watched them form and was completely fascinated by them as I drove south on the highway. Unfortunately, I had no camera with me but they are ingrained in my memory! What a wonderful birthday gift, perfect waves twice over! I saw some over Jacksonville, Illinois today. Sadly, my camera wasn’t with me. :( They were pretty awesome! I saw those the other day and was fortunate enough to have my camera with me. http://www.flickr.com/photos/jdawn82/6809560611/ Only got one or two good shots before they leveled off. We had some here in Honesdale, PA today. I was only able to take two photos – very cool! I saw these fabulous clouds in the morning at a B&B in Lynton,Devon in October this year.I took several photos but don’t know how to get them from my camera to the website! I saw them on the day before 12-21-12. You can imagine what I thought? Never saw them before, but nice to know what they are. I got a pretty good photo with a cell phone (this is in No. Cal). Should I send the photo somewhere? Saw these hidden within stratocumulus clouds one day. Sunday 10 Nov 2013. Observed a beautiful display of KHI in the sky west of Rum and Skye (Scotland) amidst a setting sun. Pics on web site per URL given in the album ‘View from Meall Gorm’. Direct link to web album image https://picasaweb.google.com/101567632500778470634/TheSceneryFromMeallGormApplecross#5944718788365326770 The cloud display was present for at least 2 hours. One large commercial jet going west threaded the cloud spirals. Just saw some during the sun rise in DC this AM. They were pink!